This is my favorite kind of crafting: mixing natural materials with recycled ones. We have tons of pine trees of all different varieties. Cones are bountiful, but you have to get them early on in the season or the squirrels will gnaw them to bits. Weeks ago I gathered bunches along with some dried pods. I had free and easy wreaths on my mind. We finally got to them last week and I'd love to share how they're made because who doesn't like a simple (and did I mention free?) project that looks lovely, too. Punch hole near the top of each doughnut and thread some twine through to create a hanging loop. Adhere natural materials to the cardboard in arrangements that are pleasing to you. In other words: PLAY! Use white glue for small pods and a glue gun for the cones. I was so disappointed that the dark and rainy days of last week made photographing them impossible... then came the inspiration to hang them outside. Our back entrance never gets much attention this time of year, but it's still in constant use. These "all weather" wreaths make it quite welcoming... and I've decided to keep them out there for the rest of the season. beautiful! 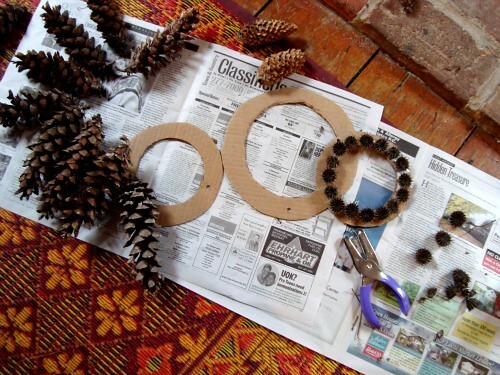 I love your use of cardboard and twine here, rather than wire, commonly used for wrapping wreaths. Wow, these pack quite the punch for something "free". They're beautiful. And are now on my "to make with kids" list. Thank you Maya! I love your use of cardboard.I’m glad to read this blog. They are the bees veritable knees. 'Nuff said. I love these. 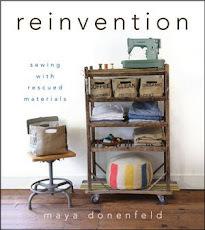 I bet they make you even happier looking at them knowing you used recycled goods to make them. I may have to give this a try. Yeah Maya those are so beautiful. Happy Monday to you, too! I will definitely be making one of these wreaths. Thanks for the inspiration! beautiful, I'll try that as well with my girls and I will hang them out side as well. Thank you! 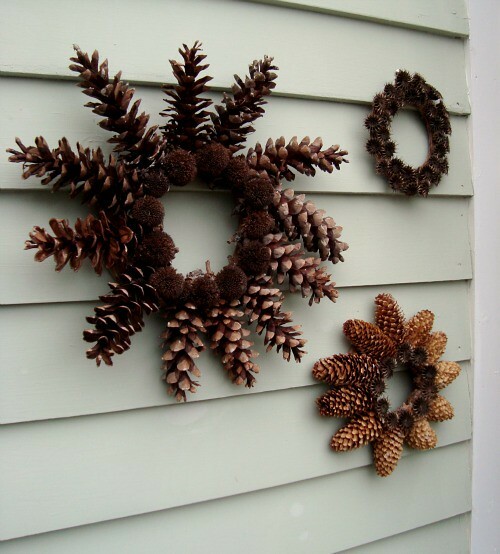 i will gather some pinecones and other natural elements to try this project. 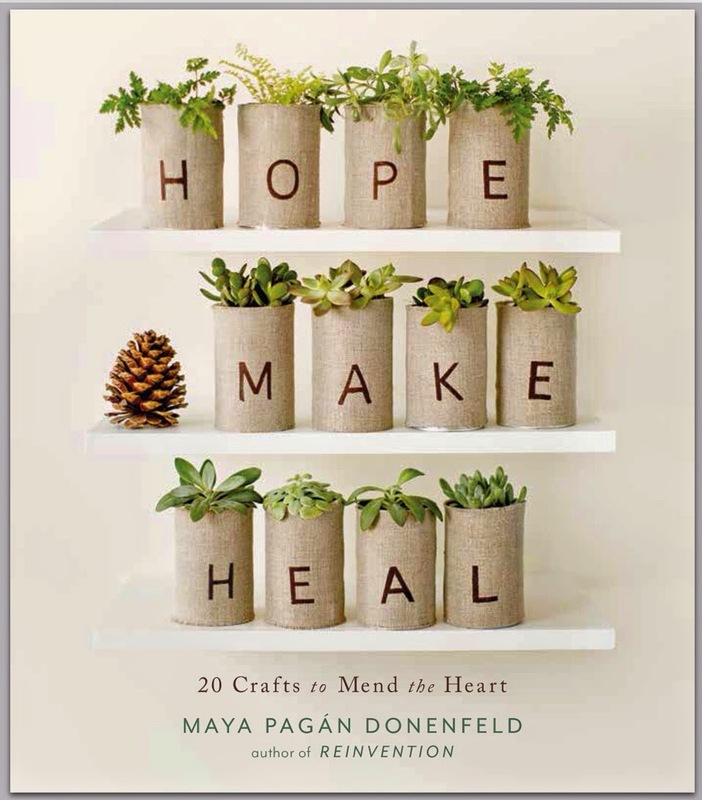 i've been trying to find a simple project for wreaths specifically to decorate one of my bookcases. these are just right. Great idea! Hmm.. now to try and find cones like that in Texas! They look lovely. They remind me of when I was living in Germany - we went out and gathered fallen pine twigs to make the wreath for our advent candles. just lovely and so simple! enjoy your week!!! Those were made for that spot. I love the simplicity of them, just striking. I just love these! Thanks for sharing! These are *lovely*, and I have a co-blogger who I think is going to adore them. Pretty, pretty, pretty. Oh, why do I live where there are no pine trees? they are gorgeous and look fantastic hanging together - you are so lucky having all those varieties of cones. Simple, free and gorgeous... my favorite craft combination! I am just pondering some ideas for my pine & spruce cones. and who shot that totally beautiful picture of you maya? Love this project for its simplicity and beauty! there are fantastic!!!! so natural, beautiful ....wow! 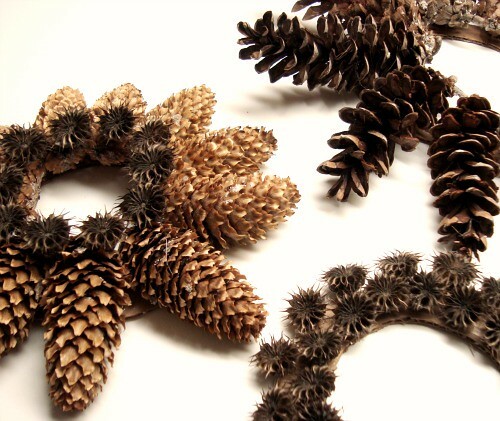 The kiddos recently went out and gathered like a bazillion small pine cones, and now I know EXACTLY what we are going to do with them! Thanks for a great idea :). I love these. I've been trying to decide how to display my pinecones and other natural bits, this looks perfect. Thanks for the idea. I love these! They are oh-so-very-naturely-cute and easy to make. I'll have to try! oh my God! you are so creative! it's not so good as yours, but I'd love to share with you. I just wanted to thank you for this wonderful idea! 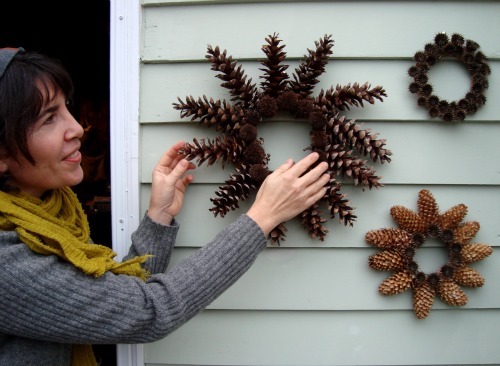 We are headed up north for the holiday weekend and my oldest and I will be packing enough warm clothes for a hike through the woods to gather all we need to make our own holiday wreaths. Thank you again! Ha - now I know what I'll be doing this weekend with my little one. Thank you. I made my own nature wreath today, thanks for the inspiration! Great project...for sure going to try this with my little ones! Love these!!! Simple, natural and lovely. Can't wait to make some with my daughters. Very pretty! I certainly have the supplies for these. This is pinned and on my to do list. Thanks!